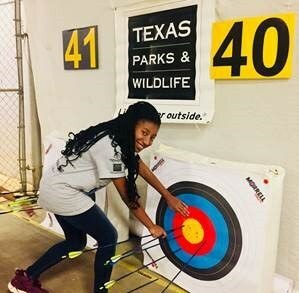 Texas - National Archery in the Schools Program (TX - NASP) provides international-style target archery training in 4th-12th grade physical education classes. It is an affiliate of the National Archery in the Schools Program (NASP®). TPWD is the official sponsor with these additional sponsors and partners. Why is TPWD committed to TX - NASP? Archery can be a casual pastime or lead to participation in tournaments at the local, State, National and Olympic levels. Educators nationwide report that NASP® engages the unengaged - inspiring students to greater achievement in school. Since 2004, TPWD staff and volunteers have certified hundreds of NASP® Archery Instructors and Trainers. Currently, over 1,350 schools actively participate in TX - NASP. In 2018, 2,253 students participated in the State Bullseye Championship Tournament with more than 1,000 students participating in the IBO 3D Challenge.